Rhododendrons are extremely popular in landscape design due to their beautiful spring blossoms. There are both deciduous and evergreen varieties of rhododendrons. Species vary in their temperature requirements--some species of rhododendron may not be cold hardy or heat tolerant. When it comes to evergreen varieties, most will need to be planted in a protected site, and winter protection may also be necessary, depending on the range of winter temperatures. Nurseries in your location will more than likely only carry varieties of rhododendron that will be hardy in your area. The American Rhododendron Society feels the rhododendron should be considered as part of the landscape rather than merely a specimen plant. It suggests using rhododendrons as a border or with other shrubs. Placing tall rhododendrons at the back of a grouping will add a dramatic effect to your landscape, and smaller plants can then be interspersed throughout the garden bed. The mature size of the plant must always be considered when choosing a planting site. Rhododendrons that outgrow their space are easily transplanted due to their shallow root system. Rhododendrons thrive in mild, humid climates. If you are not in a mild, humid climate then you must choose your planting site carefully. Usually a north or east location is best because the plants are protected from southerly or westerly winds. Strong winds tend to dry out the plants, and they can develop leaf scorch. The bark may also begin to split due to the drying winds. Rhododendrons also do well in filtered sunlight as opposed to dense shade. The American Rhododendron Society recommends that rhododendrons be planted in highly organic matter or humus--acid type compost is preferred (decayed oak leaves and pine needles). The root system of the rhododendron is very delicate, and it will not do well in heavy or rocky soils. These delicate roots also require soil that is well-drained and acidic. The pH of the soil should be from 5.0 to 5.5. There are fertilizers that are specifically designed for rhododendrons/acid-loving plants. They should be applied in late winter or early spring, following the manufacturer’s directions. Rhododendrons require minimal amounts of fertilizer compared to other shrubs. If your plant shows yellowing of the leaves it may be that it is lacking nitrogen. This is usually the case if the rhododendron has been mulched with wood chips. Most large-blossomed rhododendrons should be deadheaded (removal of the spent blossoms). To deadhead, just break off the spent blossom clump with your fingers. Removal of the spent blossoms will improve the overall appearance of the shrub and reduce possible fungal growth. According to the University of Missouri Extension, “There are few insects or diseases that are troublesome on azaleas and rhododendrons. Those that normally occur can be easily controlled with all-purpose fungicides and insecticides. 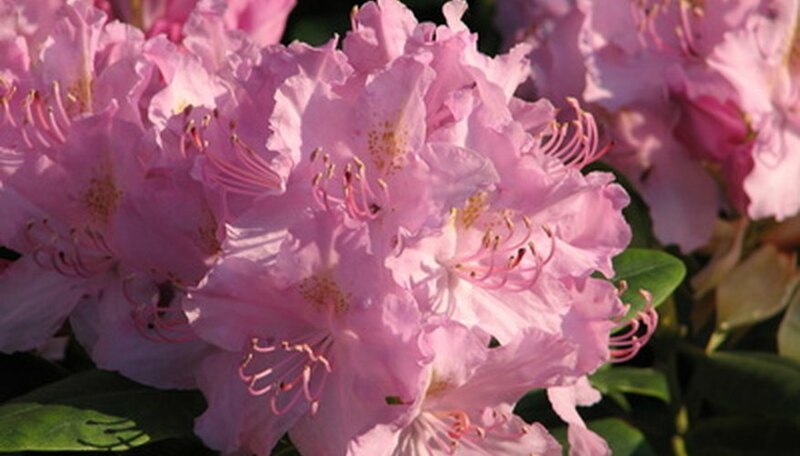 Prompt treatment as soon as the problem is noticed will be most effective.” The American Rhododendron Society mentions that insects and disease vary around the country. Lace bug and root weevil are common pests that can be controlled with insecticides.